"Jay was a very nice sales person. We felt no pressure to make the sale, great guy. I would highly recommend Auto Group if you are in the market for a vehicle." Thanks Dan, and a BIG thanks from the Auto Group! 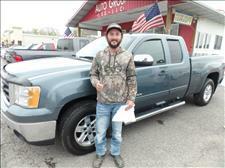 We appreciate the opportunity to earn your business, and hope you and Dillon enjoy your new GMC Sierra! "We have been more than pleased with our experience here at the Auto Group. Have never been treated with such respect and consideration at any other auto dealer. Would recommend the Auto Group to others, no doubt! Bruce was very very good to deal with, and we appreciate his kindness and willingness to work with us." Thanks Elton and Karen, and a BIG thanks from the Auto Group! 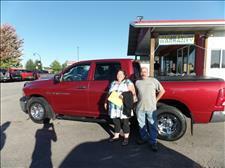 We appreciate the opportunity to earn your business, and hope you enjoy your new Dodge Ram 1500! "Auto group is very easy and very friendly to deal with its my second car i have bought from them and have sent other people here to buy from them"
Thanks Jason, and a BIG thanks from the Auto Group! 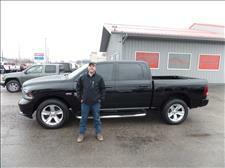 We appreciate your continued business, and hope you enjoy your new Ram 1500! "Very nice dealing with everyone at the Auto Group. This is the 2nd vehicle we have bought from them. Had a great experience both times." Thanks Ken, and a BIG thanks from the Auto Group! 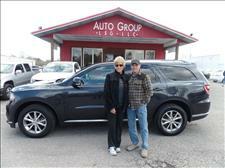 We appreciate your continued business, and hope you enjoy your new Ford Explorer! "my experience was really nice the staff here was really welcoming and bruce was great to work with helped me out and explained everything clearly so that i could understand everything really well. great place to do business." Thanks Shaun, and a BIG thanks from the Auto Group! 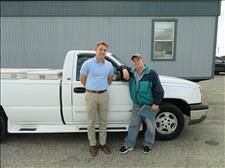 We appreciate the opportunity to earn your business, and hope you enjoy your new Chevrolet Silverado 1500! "I had a great time working with Mark to find the perfect vehicle! He exceeded my expectations and found a vehicle that had more features than I intended to get when I first started looking. We made a 2.5 hour trip to make the purchase, and I wouldn't hesitate to do it again. Thanks again, Mark!" Thanks Emily, and a BIG thanks from the Auto Group! 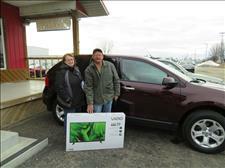 We appreciate the opportunity to earn your business, and hope everyone enjoys your new Dodge Journey! 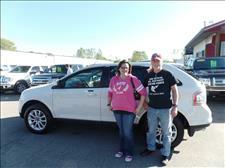 "We had a great experience purchasing our new car! Bruce was very knowledgeable and able to get us exactly what we needed!! I would recommend Auto group to everyone! They were able to work with us and get us in a car the same day!" Thanks Stephanie, and a BIG thanks from the Auto Group! 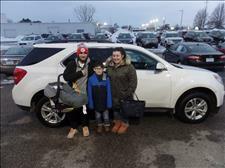 We appreciate the opportunity to earn your business, and hope the whole family enjoys your new Chevrolet Equinox! "i would really suggest people come here to buy a vehicle. They treated us fantastic and really worked hard to get us to get us a loan we liked. This is our 3rd time buying a vehicle here and would do it again.Thanks a lot guys." Thanks Chad, and a BIG thanks from the Auto Group! 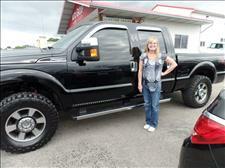 We appreciate your continued business, and hope you and Kimberly enjoy your new Ford F-350! "Jay and the entire team are amazing. They treated me with respect and worked hard to get me into the vehicle I wanted. This is my second purchase with this team and I will be back in the future!" Thanks Chantel, and a BIG thanks from the Auto Group! 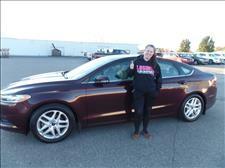 We appreciate your continued business, and hope you enjoy your new Ford Fusion! "All the people working were very helpful nice and laid back. I didn't have any complaints about anything and the vehicle I purchased was more than I expected. I'd recommend coming here to purchase a vehicle with them." Thanks Alex, and a BIG thanks from the Auto Group! We appreciate the opportunity to earn your business, and hope you enjoy your new Ram Laramie Longhorn! "excellent customer service, was very happy with Jay who helped worked with the financial portion of our car to get the pricing right where we wanted. Very happy with the overall experience at Auto Group"
Thanks Ariel, and a BIG thanks from the Auto Group! 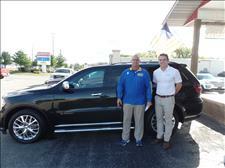 We appreciate the opportunity to earn your business, and hope you and Adam enjoy your new Buick Enclave! "i was treated with the upmost respect from Mr. Bill Dickson and would greatly recommend any to car shop at auto group"
Thanks Clay, and a BIG thanks from the Auto Group! 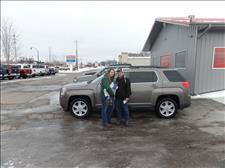 We appreciate your continued business, and hope everyone enjoys your new GMC Terrain! "The staff was very pleasant, friendly and worked hard to get me a good rate for the vehicle I wanted. I would absolutely come back again." Thanks Alisha, and a BIG thanks from the Auto Group! 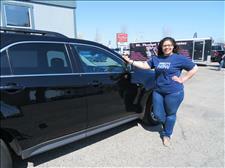 We appreciate the opportunity to earn you business, and hope you enjoy your new Ford Edge! "Our sales person, Jay Button ,was fast and professional and checked all the boxes on my wish list.All the other employees were friendly and took care of the paperwork with the same speed and accuracy." Thanks Jannie, and a BIG thanks from the Auto Group! 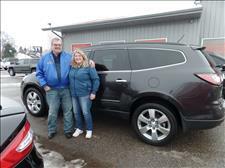 we appreciate the opportunity to earn your business, and hope you and Richard enjoy your new Chevrolet Traverse! "Mr. Bruce was an amazing help! very patient and helpful. i greatly appreciate him going above expectation, keeping his word and promise. i am very thankful!" Thanks Kent, and a BIG thanks from the Auto Group! 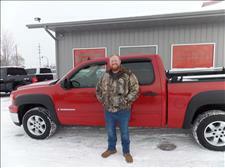 We appreciate the opportunity to earn your business, and hope you enjoy your new GMC Sierra 1500! "These guys took great care of us! Bruce was amazing. 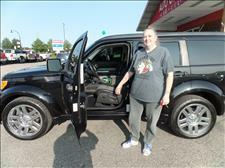 He did everything to make the trade in and purchase of our new vehicle easy and comfortable. Tiffani made the paperwork go smooth and worked with us to make sure we didn't have to make a second trip. i will absolutely be back." Thanks Brandon, and a BIG thanks from the Auto Group! 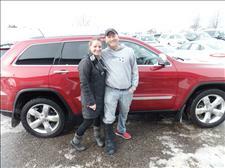 We appreciate the opportunity to earn your business, and hope you and Andrea enjoy your new Jeep Grand Cherokee! "This is our second car with this company. Our experience with the crew at auto group has been amazing. Mark is a wonderful salesman and everyone is very polite and wonderful to talk with. Thank you Auto Group." Thanks Ashley, and a BIG thanks from the Auto Group! 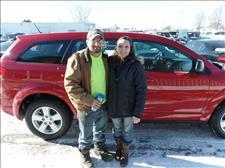 We appreciate your continued business, and hope everyone enjoy your new Ford Escape! "Thanks for everything. Awesome service like normal. Couldn't asked for better service and people to work with. Thanks for everything!!!" Thanks Derek, and a BIG thanks from the Auto Group! We appreciate your continued business, and hope you enjoy your new Ford F-250! "Auto Leasing Group of Mt. Pleasant has been very good to our family for two different auto sales. Jay Button is the dealer that we worked with at the dealership for both sales. He is very respectful and dependable as a car dealer. No hassles and very good experience!" Thanks Eric, and a BIG thanks from the Auto Group! 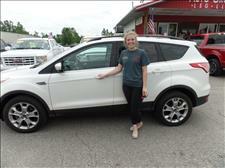 We appreciate your continued business, and hope you and Carrie enjoy your new Ford Escape! 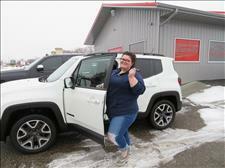 "so happy with auto group and getting me into my newer jeep! i highly recommend them for your next vehicle purchase! make sure to ask for Mark Rudy!!" Thanks Toni, and a BIG thanks from the Auto Group! 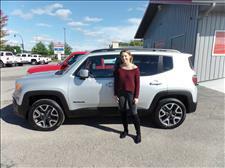 We appreciate the opportunity to earn your business, and hope you enjoy your new Jeep Renegade! "Jay was super nice and a lot of help, so was the lady who works here. it was a smooth buy and they gave me more for my trade then expected. super happy with our new family SUV!" Thanks Jenny, and a BIG thanks from the Auto Group! 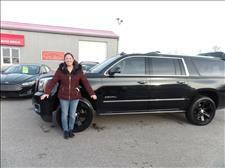 We appreciate your continued business, and hope you enjoy your new Yukon XL Denali! 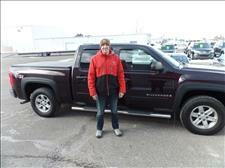 "had an awesome experience was easily worked with and was very understanding.so thank you for my new truck." Thanks Sabastion, and a BIG thanks from the Auto Group! 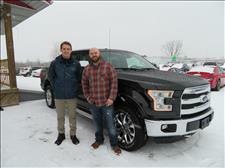 We appreciate the opportunity to earn your business, and hope you enjoy your new Ford F-150! "Customer service was fantastic and very speedy. Bill was not pushy or insistent about getting in to a vehicle and was very patient about working with me while i was still undecided about which vehicle i was going to purchase. Bill was very helpful with showing me several different vehicles so that i could make an educated decision about which vehicle was feeling like it was going to be my vehicle. Defiantly would recommend any and everyone that i know to this great company." Thanks Nathan and Chanda, and a BIG thanks from the Auto Group! 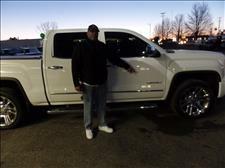 We appreciate the opportunity to earn your business, and hope you enjoy your new GMC Sierra! "Great service, worked well with our crazy schedule! will definitely send friends and family here." Thanks Rachael and Jason, and a BIG thanks from the Auto Group! 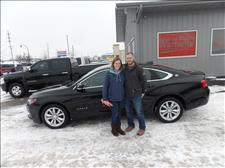 We appreciate the opportunity to earn your business, and hope you enjoy your new Chevrolet Impala! "I had a great experience working with Mark at Auto Group of Mt. Pleasant. The entire staff was welcoming and provided an excellent service." Thanks Tom, and a BIG thanks from the Auto Group! 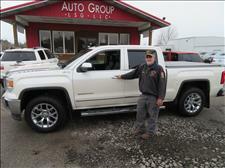 We appreciate the opportunity to earn your business, and hope you enjoy your new GMC Sierra! 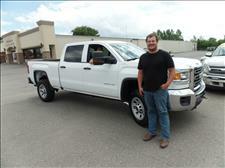 "Great service was willing to find a truck that matched what I was looking for. And the engine warranty was an added bonus"
Thanks Phillip, and a BIG thanks from the Auto Group! 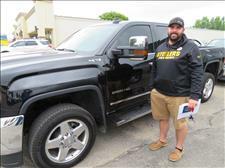 We appreciate the opportunity to earn your business, and hope you enjoy your new GMC Sierra! "Excellent service from all the staff at Auto Group. We could not have asked for a better experience! Mark, Brandon and Tiffany were very professional and friendly. We will recommend Auto Group to everyone we know looking for a new vehicle!" Thanks Lauren, and a BIG thanks from the Auto Group! 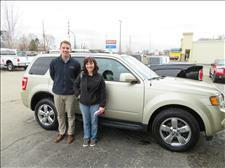 We appreciate the opportunity to earn your business, and hope you and Torey enjoy your new Ford Explorer! "Dwayne and Brian were great to work with. Along with the rest of there team, Brandon and Tiffani This is our 2nd purchase from this dealer and we will buy from them again"
Thanks Ronald and Lily, and a BIG thanks from the Auto Group! 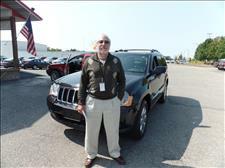 We appreciate your continued business, and hope you enjoy your new Jeep Grand Cherokee! "Bruce was very patient and a gentleman. was not pushy and selfish like most salesman. was very honest and i am very happy with our deal today i will be back in a year or so to trade in and re finance for something with third row seat next year and all wheel drive. thank you." Thanks William and Sarah, and a BIG thanks from the Auto Group! 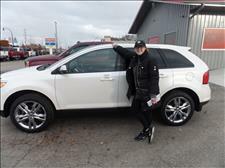 We appreciate the opportunity to earn your business, and hope you enjoy your new Dodge Journey! "We have worked with Mark and the Auto Group more than once over the years and every time we have walked out with a vehicle and very pleased with our experience and purchase. We just love Mark!" Thanks Shawn and Katie, and a BIG thanks from the Auto Group! We appreciate your continued business, and hope you enjoy your new Ford Explorer! 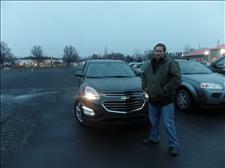 "Our salesperson, Jay was so knowledgeable. We are so pleased with how we were treated and with the car buying process through Auto Group. Tiffani, the finance manager, is so nice and helpful. The place was clean with a beautiful lot full of nice vehicles. We are very happy with our purchase and the people through Auto Group Leasing LLC." Thanks Alan, and a BIG thanks from the Auto Group! 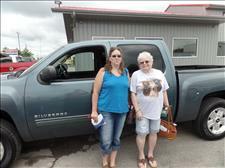 We appreciate the opportunity to earn your business, and hope you and Callie enjoy your new Ram 1500! "Awesome Experience! I talked with Jay via email before coming up and he assured me they would be able to get me into the vehicle that fit my budget, and he did exactly that! Thank you very much for the positive experience!" Thanks Tim, and a BIG thanks from the Auto Group! We appreciate the opportunity to earn your business, and hope you enjoy your new Chevrolet Equinox! "Dwayne was very friendly and easy to work with. Made the whole experience smooth and quick." Thanks Gary, and a BIG thanks from the Auto Group! We appreciate the opportunity to earn your business, and hope you enjoy your new GMC Acadia Denali! "Bill and Tiffany were very helpful in finding and financing the right vehicle for me, my lifestyle and budget. Their customer service and personable personalities made my buying experience amazing! I would buy again and recommend The Auto Group to friends and family." Thanks Summer, and a BIG thanks from the Auto Group! 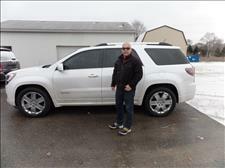 We appreciate the opportunity to earn your business, and hope you enjoy your new GMC Terrain! "Very great group of employees. Would encourage anyone to use Bruce as a salesman." Thanks Robert, and a BIG thanks from the Auto Group! 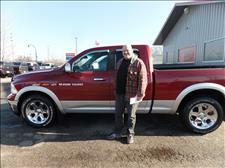 We appreciate the opportunity to earn your business, and hope you enjoy your new Ram 1500! "Stopped in and had a great experience. Mark was more than willing to help me with everything I needed and answered any questions I had. They made me feel welcome. I would definitely stop here if you were ever wanted to look at a new car." Thanks Daniel, and a BIG thanks from the Auto Group! 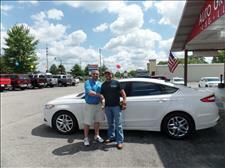 We appreciate the opportunity to earn your business, and hope you enjoy your new Ford Fusion! "Tyler and team made the experience smooth! thank you for everything"
Thanks Jessica, and a BIG thanks from the Auto Group! 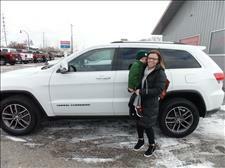 We appreciate the opportunity to earn your business, and hope you and Hudson enjoy your new Jeep Grand Cherokee! "Very helpful staff, fair pricing, and great care. We are return customers, and will continue to be!" Thanks Bob, and a BIG thanks from the Auto Group! 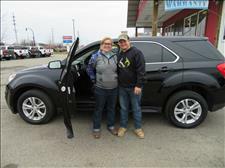 We appreciate your continued business, and hope you and Elisabeth enjoy your new Chevrolet Equinox! "this is the best i have been treated at a dealership, and this is the only dealership that i have been to in the last two weeks that would go out of there way to help me get a new truck. i will recommend auto group to everyone i know looking for a car and i will definitely be coming back after this truck is payed for to buy another truck. the people were vary helpful and very nice." Thanks Anthony, and a BIG thanks from the Auto Group! 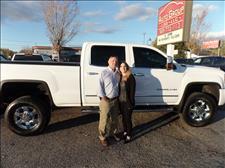 We appreciate the opportunity to earn your business, and hope you enjoy your new Silverado! "This purchase was like meeting old friends. Everyone was so kind, courteous. Would do business here again." Thanks Marshall and Sunny, and a BIG thanks from the Auto Group! 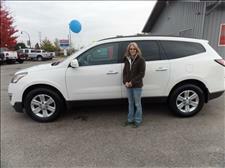 We appreciate the opportunity to earn your business, and hope you enjoy your new Chevrolet Traverse! "Always a pleasure working with the guys at auto group. quick and simple. thanks again"
Thanks Ryan, and a BIG thanks from the Auto Group! 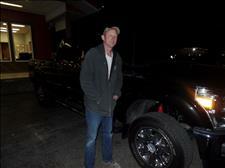 We appreciate your continued business, and hope you enjoy your new GMC Sierra! 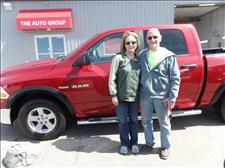 "Mark at Auto Group was very helpful.We are driving away with a great Dodge Ram." Thanks Kathy, and a BIG thanks from the Auto Group! 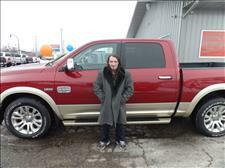 We appreciate the opportunity to earn your business, and hope you and Kevin enjoy your new Ram! "I had been looking for a vehicle for awhile. Auto Group was able to get me financed for a lower interest rate and a bit more so I could get the vehicle I wanted. Their customer service and want to genuinely help is amazing. If I could give them more stars I would." Thanks Jordan, and a BIG thanks from the Auto Group! 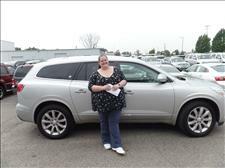 We appreciate the opportunity to earn your business, and hope you enjoy your new Buick Enclave! "This was probably the easiest and smoothest process I've gone through with purchasing a new vehicle. They worked very hard to get me into a car and worked with me with a few setbacks I had. Very pleased!" Thanks Cory, and a BIG thanks from the Auto Group! 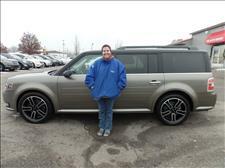 We appreciate the opportunity to earn your business, and hope you enjoy your new Ford Flex! "Thanks to the Auto Group, my experience buying my first car by myself has been something I will always remember. Mark and Tiffani made the process very exciting and easy!" Thanks Kylie, and a BIG thanks from the Auto Group! We are glad we were able to make your first purchase a memorable one! 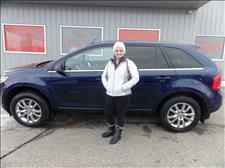 From all of us from the Auto Group we hope you enjoy your new Ford Edge! 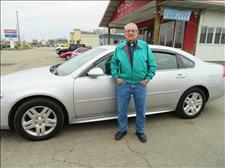 "over all good experience, staff friendly, and easy smooth sale with our salesperson Bruce Laufer. Appreciate his experience and salesmanship.. thanks to all!!!" Thanks Marcia, and a BIG thanks from the Auto Group! We appreciate the opportunity to earn your business, and hope you and Glen enjoy your new Cadillac SRX! "Bill was awesome! So friendly and answered any questions we had. I would definitely buy from him again. Thanks Bill!" Thanks Autumn, and a BIG thanks from the Auto Group! 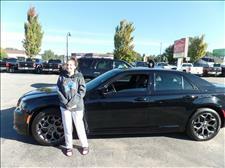 We appreciate the opportunity to earn your business, and hope you enjoy your new Chrysler 300 S! "Very helpful and friendly staff! No pressure, laid back and easy!!" Thanks Kelsey, and a BIG thanks from the Auto Group! We appreciate the opportunity to earn your business, and hope you enjoy your new GMC Acadia Denali! Thank you to the sales team and financing for going above and beyond in the transition form our '13 Chevy LTZ to '15 GMC Denali. The process was simple and they made it easy. Thanks Jerry and Whitney, and a BIG thanks from the Auto Group! We appreciate the opportunity to earn your business, and hope you enjoy your new GMC Sierra HD Denali! "Dwayne, Katie, and Brandon were great to work with. I will be back to buy from here again"
Thanks Deb, and a BIG thanks from the Auto Group! 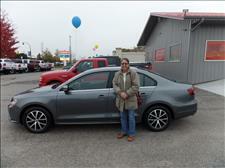 We appreciate the opportunity to earn your business, and hope you enjoy your new Volkswagen Jetta! "Everyone at Auto group made our car buying experience simple. Bill answered all our questions and treated us as if we were family. We never felt any pressure to buy or test drive anything that wasn't what we liked or needed. Auto Group's web site is awesome it's user friendly by far the best web site I've used. We look forward to purchasing from Auto Group in the future." Thanks Bill and Madonna, and a BIG thanks from the Auto Group! 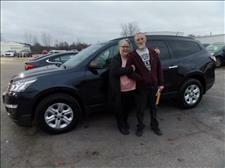 We appreciate the opportunity to earn your business, and hope you enjoy your new Chevrolet Traverse! "I had some of the best sales service at the auto group in Mount Pleasant. They were very nice, and tried finding me the best car possible. I appreciate them very much." Thanks Ashlie, and a BIG thanks from the Auto Group! 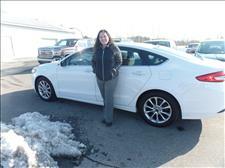 We appreciate the opportunity to earn your business, and hope you enjoy your new Ford Fusion! "The best customer experience while buying a car - hands down!! Mark and everyone at Auto Group Leasing LLC is professional, honest, and helpful. From the moment Mark called me on my phone to handing me the car keys, it was a smooth and honest transaction. It was a relief to meet great car salesmen at this store, I will send all my friends and family to this shop... and I'll be back for my next SUV! The owner was kind enough to come out and shake my hand while I was in the lobby... great people at all levels of this organization. Thank you Mark and Auto Group!!" Thanks Brittany, and a BIG thanks from the Auto Group! We appreciate the opportunity to earn your business, and hope you enjoy your new Lincoln MKX! Mark, was wonderful to work with. Everyone was helpful and made the process easy. Trustworthy dealership. Thanks Michael, and a BIG thanks from the Auto Group! 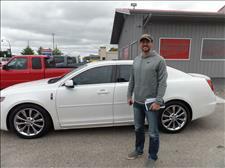 We appreciate the opportunity to earn your business, and hope you enjoy your new Lincoln MKS! "This is my second time here, and I'm again very happy with my experience, sales staff and service! Most excellent and very helpful." Thanks Jan, and a BIG thanks from the Auto Group! We appreciate your continued business, and hope you enjoy your new Ford Escape! 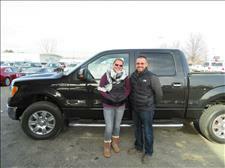 "Mark and Tiffany made our experience buying a truck a fantastic experience. Mark was great he let us drive 3 trucks and everyone of them were nice but we finally bought a beautiful truck and I couldn't believe how many nice vehicles they had on the lot. Tiffany did all the financial paper work and she had a very nice personality and made our signing easy and made me want to come back just to hang out. The office and atmosphere was up and above most places. I'm sure I'll be back." Thanks Gerald and Vicki, and a BIG thanks from the Auto Group! We appreciate the opportunity to earn your business, and hope you enjoy your new Nissan Titan! "Brandon (GM), Bruce (Sales) and Tiffany (Finance Manager) were FANTASTIC! Professional and all around wonderful dealership to work with. I had traded in and purchased a used vehicle and will be back when the time is needed for another vehicle. I also plan to refer to this dealership." Thanks Mandy, and a BIG thanks from the Auto Group! 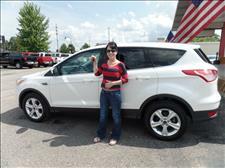 We appreciate the opportunity to earn your business, and hope you enjoy your new Ford Escape! "Dwayne was great to work with. Auto Group is where you should buy your next vehicle. I will suggest these guy's to everyone. Very Happy." Thanks Cassie, and a BIG thanks from the Auto Group! 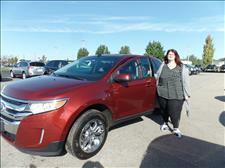 We appreciate the opportunity to earn your business, and hope you enjoy your new Ford Edge! "very satisfied with the service. friendly and helpful staff. thank you so much." Thanks Dave, and a BIG thanks from the Auto Group! We appreciate the opportunity to earn your business, and hope you and the whole family enjoy your new Chevrolet Silverado! "I like how they are more like a Family, not pushy !! Best place I've ever dealt with." Thanks Lynn and Patrick, and a BIG thanks from the Auto Group! We appreciate the opportunity to earn your business, and hope you enjoy your new Jeep Grand Cherokee! "Dwayne and Tiffany were great. 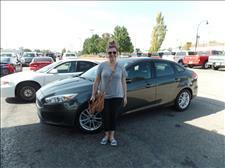 We will be back here to buy our next vehicle"
Thanks Adrianna, and a BIG thanks from the Auto Group! 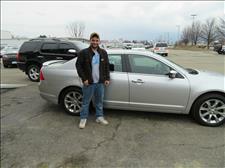 We appreciate the opportunity to earn your business, and hope you enjoy your new Chrysler 300! "Everyone was extremely helpful. They gave us the best possible deal and I am very happy with my new car. I highly recommend coming here if you're looking for a new car. Everyone is super friendly and they are very flexible with prices!" Thanks Katie, and a BIG thanks from the Auto Group! We appreciate the opportunity to earn your business, and hope you enjoy your new Jeep Renegade! "Treated awesome, You guys are great, Recommend you buy your vehicle here." Thanks Brian, Candiss and Janet, and a BIG thanks from the Auto Group! 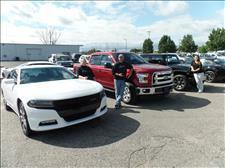 We appreciate the opportunity to earn your business, and hope you enjoy your new Charger, F-150 and Jeep Wrangler! "Great Customer Service the first and the second purchase. Tiffany and Bruce were a great help and very understanding. Definitely recommend the auto group of Mt. Pleasant!!" Thanks Jeff and Mallory, and a BIG thanks from the Auto Group! We appreciate your continued business, and hope you enjoy your new Ford F-150! "Mark was great , and Tiffany was very fast and efficient. I will be recommending them to all my friends. Thank you again"
Thanks Denise, and a BIG thanks from the Auto Group! We appreciate the opportunity to earn your business, and hope you enjoy your new Chevrolet Equinox! "was great doing business with Bruce. Very friendly would recommend anyone to deal with him"
Thanks Robin and Kenneth, and a BIG thanks from the Auto Group! We appreciate the opportunity to earn your business, and hope you enjoy your new Chevrolet Equinox! "i came into check out a vehicle my wife and i seen online. Mark in sales was fast and courteous. 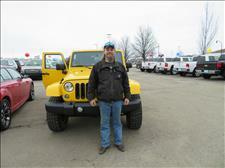 I was in and out with the fast friendly service and a new Jeep!" Thanks Michael, and a BIG thanks from the Auto Group! 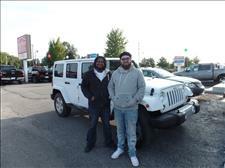 We appreciate the opportunity to earn your business, and hope Tamarrah, Manny and you enjoy your new Jeep Liberty! "Jay was fantastic, and Katie was totally on top of everything. Great experience, and I will be recommending them to my parents and anyone else I know looking for a vehicle." Thanks Lilah, and a BIG thanks from the Auto Group! 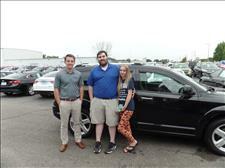 We appreciate the opportunity to earn your business, and hope you enjoy your new Buick Enclave! He is always very helpful and isn't happy until I am. That is not an easy task. :)"
Thanks Nicole and Rod, and a BIG thanks from the Auto Group! 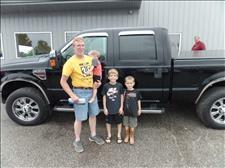 We appreciate your continued business, and hope you enjoy your new Ford F-250! "i had a friendly experience, got all the help i needed and i'm going to make sure that i tell all my friends and family about the auto group." Thanks Tyler, and a BIG thanks from the Auto Group! 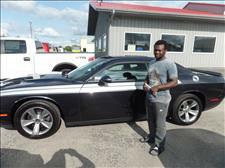 We appreciate the opportunity to earn your business, and hope you enjoy your new Dodge Challenger! "I am a repeat customer and should i need another vehicle i will come back everyone here is polite helpful and friendly"
Thanks Loretta, and a BIG thanks from the Auto Group! 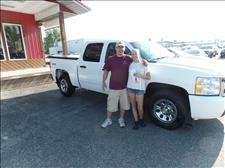 We appreciate your continued business, and hope you enjoy your new Chevrolet Silverado 1500! "very great salesmanship,helpful and not pushy. love my newer truck. thank you Mark and Tiff." Thanks John, and a BIG thanks from the Auto Group! 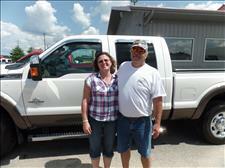 We appreciate the opportunity to earn your business, and hope you enjoy your new Ford F-250! "very good i would buy another vehicle from them for sure! everyone treated me very well." Thanks Jeff, and a BIG thanks from the Auto Group! 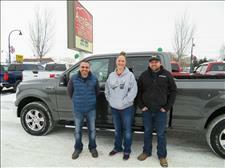 We appreciate the opportunity to earn your business, and hope you enjoy your new Ford F-150! "extremely friendly worked with me to figure out a deal, good value on trade in,ask for Bruce he was awesome to work with"
Thanks Nick, and a BIG thanks from the Auto Group! 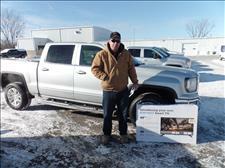 We appreciate the opportunity to earn your business, and hope you enjoy your new GMC Sierra 2500! "I have never been treated as well as I have been here at the Auto Group. Buying a used car, has never been as easy as the experience I have had here. Bill made it enjoyable." Thanks Ron, and a BIG thanks from the Auto Group! 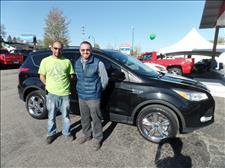 We appreciate the opportunity to earn your business, and hope you enjoy your new Ford Escape! "awesome everybody did well as part of the team. Bill was very well in answering all questions...."
Thanks Doyle, and a BIG thanks from the Auto Group! 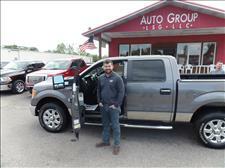 We appreciate the opportunity to earn your business, and hope you enjoy your new Ford F-150! 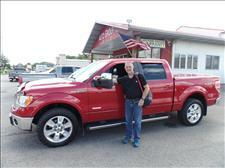 "Bill was very helpful in finding the right truck and the financing process was a breeze!" Thanks Trevor, and a BIG thanks from the Auto Group! We appreciate your continued business, and hope you enjoy your new Ford F-150! "We are three time customers..! Bruce at Auto Group does an excellent job. We have always been taken care of." Thanks Bob, and a BIG thanks from the Auto Group! 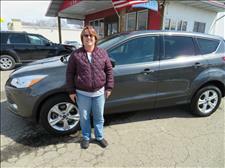 We appreciate your continued business, and hope you and Lisa enjoy your new Ford Escape! "Bruce was amazing, respectful and very helpful in every way! He made sure that I received exactly what I wanted and needed in such short time period and worked very well around my full time schedule. Tiffany was also a very big help and did an amazing job communicating with my self and my grandmother who lives out of state. My experience with Auto Group and all of the staff was definitely the best I've had with any car dealership in the Mount Pleasant!!!" Thanks Alexis, and a BIG thanks from the Auto Group! 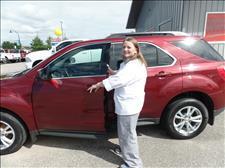 We appreciate the opportunity to earn your business, and hope you enjoy your new Chevrolet Equinox! "great place to purchase a vehicle. very friendly staff. Will for sure buy my next vehicle from here. Big thumbs up!!!!!!" Thanks Ken, and a BIG thanks from the Auto Group! We appreciate the opportunity to earn your business, and hope you enjoy your new Chevrolet Silverado! 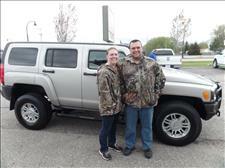 "We had a great buying experience at The Auto Group! Both Bill and Tiffani were great to work with and answered all of our questions. 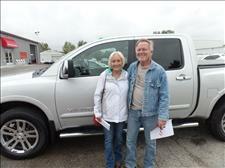 Thank you both for the great truck buying experience!!" Thanks Chandra, and a BIG thanks from the Auto Group! 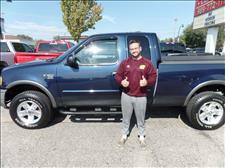 We appreciate the opportunity to earn your business, and hope you and Josh enjoy your new Ford F-150! "This is my third car from The Auto group. Bruce always makes it easy to buy here. Thanks again." Thanks Jim, and a BIG thanks from the Auto Group! 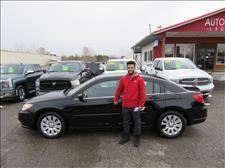 We appreciate your continued business, and hope you enjoy your new Chevrolet Impala! "Everything throughout the whole buying process was easy and professional. This was the easiest online buying experience I've had. Thank you." Thanks Steve, and a BIG thanks from the Auto Group! 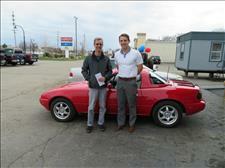 We appreciate the opportunity to earn your business, and hope you enjoy your new Mazda Miata! 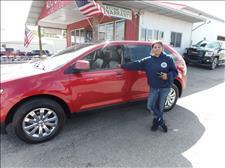 "I had a GREAT experience here at Auto Group! Mark was phenomenal to work with and so was Tiffany. They made the process very stress free and explained everything with great detail and had my best interest in mind. Thank you!!!" Thanks Rebecca, and a BIG thanks from the Auto Group! We appreciate the opportunity to earn your business, and hope you enjoy your new Chevrolet Equinox! "This is our fourth time dealing with Auto Group. 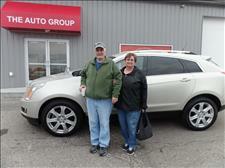 Jay is great to deal with"
Thanks Don and Jeanie, and a BIG thanks from the Auto Group! 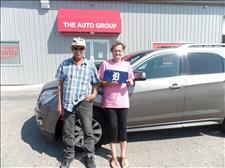 We appreciate your continued business, and hope you enjoy your new Chevrolet Equinox! 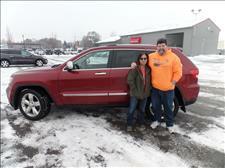 "Just bought a 2011 Jeep Grand Cherokee from Mike, my over all experience was AMAZING!!! Between Mike and Kate, they both did a fabulous job and got me right into the vehicle I was looking for! I highly recommend talking with Mike!" Thanks Heather, and a BIG thanks from the Auto Group! We appreciate the opportunity to earn your business, and hope everyone enjoys your new Jeep Grand Cherokee! "Bruce was fun to work with. he answered all my questions. Tiffani was especially helpful in the finance department. So far it has been a good experience." Thanks Jackie, and a BIG thanks from the Auto Group! 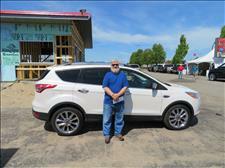 We appreciate the opportunity to earn your business, and hope you enjoy your new Ford Escape! "Great experience, sales person (mark) was very helpful with answering questions and concerns we had. 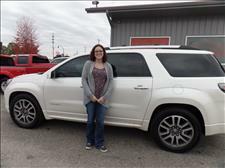 This is our third vehicle we have bought from Auto Group Leasing and we have had great experiences every time!" Thanks Jessica, and a BIG thanks from the Auto Group! We appreciate your continued business, and hope you and Duel enjoy your new Jeep Wrangler! "Everyone was very helpful. Bill was patient and was able to work around and help get me my first car!" Thanks Jordan, and a BIG thanks from the Auto Group! We appreciate the opportunity to earn your business, and hope you enjoy your new Chrysler 200! "You guys were amazing people. Treated us so nicely, would recommend this place to everyone. Thank you for everything. Means a lot to us." Thanks Kole, and a BIG thanks from the Auto Group! 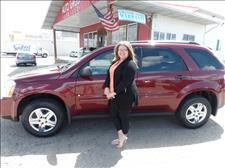 We appreciate the opportunity to earn your business, and hope you and Sidney enjoy your new Chevrolet Equinox! "Bill is a very personable salesperson! The entire staff at The Auto Group was great, everyone worked with us and the truck is beautiful! I highly recommend The Auto Group to anyone who needs a great truck - and they have a lifetime warranty on the engine of the truck!" Thanks Kathleen and Gary, and a BIG thanks from the Auto Group! We appreciate the opportunity to earn your business, and hope you enjoy your new Ford F-150! "Thank you for your wonderful service! Staff was kind. Mike was great to work with. We will definitely recommend to others." Thanks Kevin and Nickie, and a BIG thanks from the Auto Group! We appreciate the opportunity to earn your business, and hope everybody enjoys your new Lincoln Navigator! "i feel great with this company helping me, got me in a vehicle when no one else would"
Thanks Joseph, and a BIG thanks from the Auto Group! We appreciate the opportunity to earn your business, and hope you enjoy your new Ford Fusion! "Bill answered all my questions and treated me well I would do business with him again"
Thanks Dan, and a BIG thanks from the Auto Group! 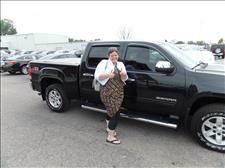 We appreciate the opportunity to earn your business, and hope you enjoy your new GMC Sierra 1500! "very helpful and explained very well. very respectful. incredibly informative, stayed patient with us while figuring out banking information. 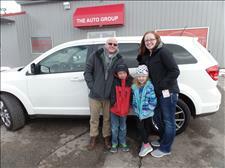 everyone was nice and this was the easiest sale we have ever had purchasing a car." Thanks Jake and Kaylea, and a BIG thanks from the Auto Group! 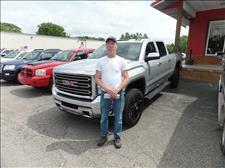 We appreciate the opportunity to earn your business, and hope you enjoy your new GMC Sierra! "great customer service, very helpful. will recommend you guys to everyone"
Thanks Jody, and a BIG thanks from the Auto Group! 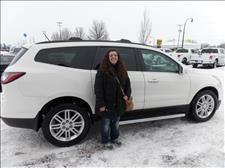 We appreciate the opportunity to earn your business, and hope you enjoy your new Ford Escape! "Brandon and Tiffany were wonderful to work with. Every time we need a new vehicle they always find us the perfect one!" Thanks Elissa, and a BIG thanks from the Auto Group! We appreciate your continued business, and hope you enjoy your new Ford F-150! "Jay was a great help with everything I needed and answered all my questions well. Definitely a great place to purchase a vehicle." Thanks Harry, and a BIG thanks from the Auto Group! 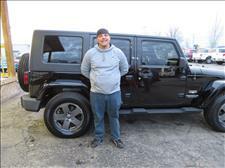 We appreciate your continued business, and hope you enjoy your new Jeep Wrangler! "Great staff! 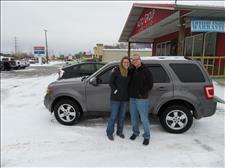 Bruce and Tiffani were very helpful!" Thanks Emily, and a BIG thanks from the Auto Group! We appreciate the opportunity to earn your business, and hope you enjoy your new Lincoln MKZ! 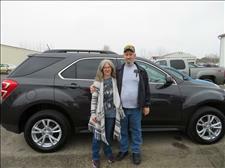 "We had a great experience purchasing our new car. We came in with some strict requirements, and we were met with respect. Would definitely come here again!" Thanks Chris and Cassie, and a BIG thanks from the Auto Group! 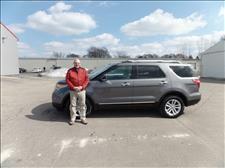 We appreciate the opportunity to earn your business, and hope you enjoy your new Ford Escape! "Excellent dealership! Very friendly people! I would recommend them to anyone!" Thanks Mark, and a BIG thanks from the Auto Group! We appreciate the opportunity to earn your business, and hope you enjoy for new Ford F-150 King Ranch! "Bill was very helpful! They worked hard to ensure my business and I am very pleased with my new vehicle." Thanks Amber, and a BIG thanks from the Auto Group! We appreciate the opportunity to earn your business, and hope you enjoy your new GMC Envoy! 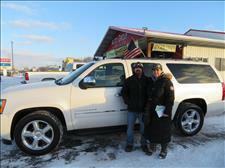 "Very professional when seeking a vehicle that I was looking for. Even looked for a vehicle to make the sale and ended up finding the perfect one for me. I would definitely recommend them to friends and family." Thanks Nicholas, and a BIG thanks from the Auto Group! 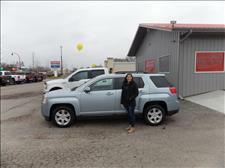 We appreciate the opportunity to earn your business, and hope you enjoy your new GMC Terrain! "Great job, great customer service. I would recommend others to come to the Auto Group to see Bruce he is a Awesome guy God Bless him"
Thanks Kevin, and a BIG thanks from the Auto Group! We appreciate your continued business, and hope you enjoy your new GMC Sierra Denali! "I found everyone to be quite helpful, with the overall service and willingness to help me properly afford what I needed was greatly appreciated and made for a very appreciative transaction overall." Thanks Parker, and a BIG thanks from the Auto Group! 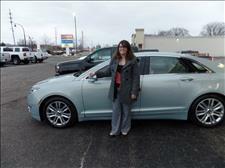 We appreciate the opportunity to earn your business, and hope you enjoy your new Ford Fusion! "Bill has been amazing!! Second time working with him and I would recommend him to everyone." Thanks Jenna, and a BIG thanks from the Auto Group! We appreciate your continued business, and hope you enjoy your new Ford Escape! "Great experience here at the Auto Group! Bill was wonderful! No pressure and no stress. Thank you Much. My finance girl was super too!" Thanks Michelle, and a BIG thanks from the Auto Group! 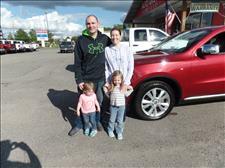 We appreciate the opportunity to earn your business, and hope you enjoy your new Dodge Durango! "very wonderful staff great people would have any one come here"
Thanks Kristphor, and a BIG thanks from the Auto Group! 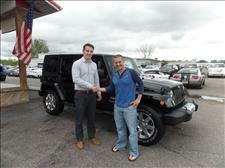 We appreciate the opportunity to earn your business, and hope you enjoy your new Jeep Wrangler! "very nice experience today at Auto Group. All personal was very kind. Met the new owner and happy that we came back to Auto Group, will suggest others shop here. Thank You." Thanks Rockey and Shirley, and a BIG thanks from the Auto Group! We appreciate your continued business, and hope you enjoy your new Ford Edge! "Always great service at The Auto Group! The team here is awesome and we will continue to be repeat customers!" Thanks Lindsey, and a BIG thanks from the Auto Group! We appreciate your continued business, and hope you and Michael enjoy your new Toyota Corolla! "Jay has been wonderful, has answered all our questions, and very professional. he has gone above and beyond our expectations"
Thanks Sam, and a BIG thanks from the Auto Group! 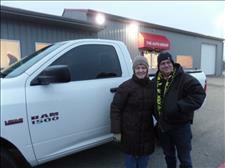 We appreciate the opportunity to earn your business, and hope you and Darlinda enjoy your new Ram 1500! "We are very happy with our purchase and how we were treated after being a return customer. Thanks for everything." Thanks David, and a BIG thanks from the Auto Group! 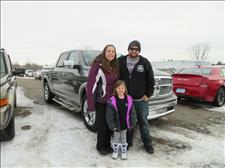 We appreciate your continued business, and hope you, Ashley, and your daughter enjoy your new Ram 1500! "Super easy to work with and great atmosphere. We settled on a price we were both good with and happy with the sale. Everyone was so nice and helpful." Thanks Billijo, and a BIG thanks from the Auto Group! 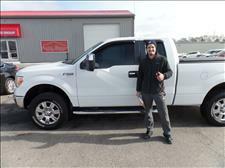 We appreciate the opportunity to earn your business, and hope you and Josh enjoy your new Ford F-350! "Staff was very friendly and helpful. I would highly recommend The Auto Group for friends and family." Thanks Tiffany, and a BIG thanks from the Auto Group! 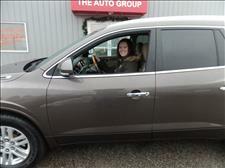 We appreciate the opportunity to earn your business, and hope you enjoy your new Chevrolet Traverse! "he [Mike] was very kind and welcoming. he answered all my questions i needed and got me the car i wanted. Great job"
Thanks Equandre, and a BIG thanks from the Auto Group! We appreciate the opportunity to earn your business, and hope you enjoy your new Cadillac Deville! 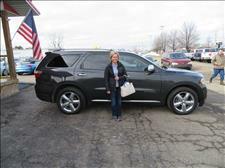 "we came in to get information on a suv and they were super friendly and helpful. we are now leaving with a brand new ford edge. thank you for being so helpful." Thanks Christopher, and a BIG thanks from the Auto Group! 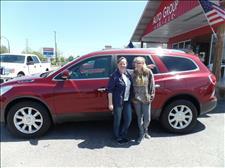 We appreciate the opportunity to earn your business, and hope Niki, Skylar, and yourself enjoy your new Ford Edge! "Bruce was great to work with. Easy car-buying experience!" Thanks John, and a BIG thanks from the Auto Group! 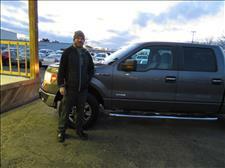 We appreciate the opportunity to earn your business, and hope you enjoy your new Ford F-150! 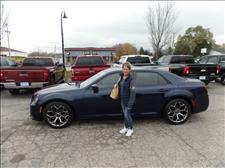 "I had very good luck at Auto Group finding a new vehicle! The purchasing process went super smooth. Thanks Bruce & Tiffany." Thanks Bailey, and a BIG thanks from the Auto Group! 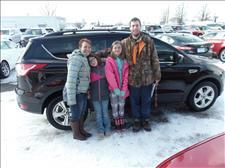 We appreciate the opportunity to earn your business, and hope you enjoy your new Ford Edge! "This is the second vehicle we bought in the last few months. They worked with us to get the vehicle as well as the pricing we wanted. We are very happy with our purchases." Thanks Todd and Pamela, and a BIG thanks from the Auto Group! 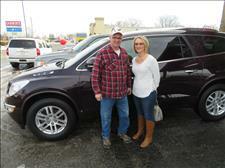 We appreciate your continued business, and hope you both enjoy your new Buick Enclave! 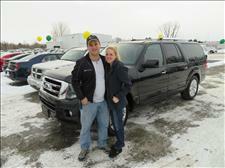 "This was a good company that worked with me to find a price that fit my needs for the vehicle that I was looking for. I would use this dealership to find another vehicle in the future." Thanks Caleb, and a BIG thanks from the Auto Group! We appreciate the opportunity to earn your business, and hope you enjoy your new Jeep Grand Cherokee! "one call, a couple texts and about an hour. I was on my way with the truck I wanted." Thanks Katie, and a BIG thanks from the Auto Group! 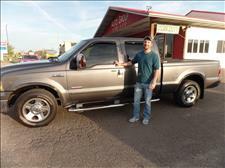 We appreciate the opportunity to earn your business, and hope you enjoy your new Ford F-250! 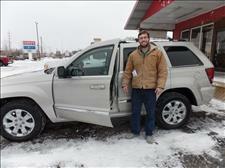 "Brandon offered excellent customer service. He was fast at returning our calls. I would highly recommend The Auto Group to anyone looking for a vehicle." Thanks Eric and Jessica, and a BIG thanks from the Auto Group! 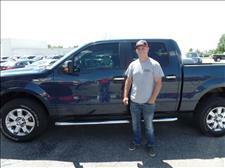 We appreciate the opportunity to earn your business, and hope you enjoy your new Ford F-150! "Quick and easy, mike was really helpful throughout the whole process." Thanks Micah, and a BIG thanks from the Auto Group! 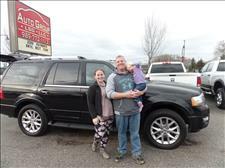 We appreciate the opportunity to earn your business, and hope you and Amanda enjoy your new Ford Expedition! 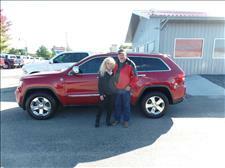 "We purchased our second vehicle from Bruce, who once again took great care of us! Thank you to Katie for making the financing a breeze! Would definitely recommend Auto Group for your next vehicle purchase!" Thanks Tammy, and a BIG thanks from the Auto Group! We appreciate your continued business, and hope you and Richard enjoy your new Chevrolet Suburban! "fantastic experience everyone was awesome We will be back the next time we need a vehicle"
Thanks John, and a BIG thanks from the Auto Group! 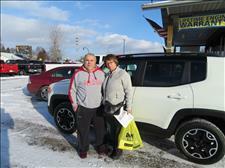 We appreciate the opportunity to earn your business, and hope you and Laurie enjoy your new Jeep Renegade! "Purchasing was quick and fairly painless. Even got a better rate than the one from my local bank." Thanks Matthew, and a BIG thanks from the Auto Group! We appreciate the opportunity to earn your business, and hope you enjoy your new Ford Fiesta! "I had a great experience with Mark Rudy! Very easy to work with and did whatever it took to get me into my new vehicle today! Very Very satisfied!" Thanks Justin, and a BIG thanks from the Auto Group! 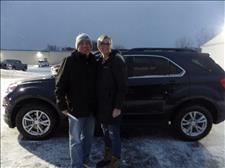 We appreciate the opportunity to earn your business, and hope you enjoy your new Chevrolet Traverse! "mark is so great i came back for a second time just to buy from him." Thanks Alicia, and a BIG thanks from the Auto Group! We appreciate your continued business, and hope you enjoy your new Ford Escape! "Easy to work with, willing to negotiate to find us the best price for our budget. Excited for our new truck." Thanks Jennifer, and a BIG thanks from the Auto Group! 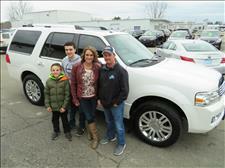 We appreciate the opportunity to earn your business, and hope you, Derek, and Lydia enjoy your new Ford Expedition! "The were really great with us. I came prepared and the salesman was very knowledgeable and friendly. The whole experience was great. The financing department was super too!" Thanks Bonnie, and a BIG thanks from the Auto Group! 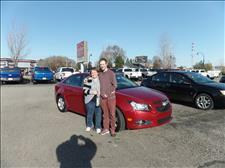 We appreciate the opportunity to earn your business, and hope you enjoy your new Chevrolet Cruze! "Bill was great! He was very friendly, and he went way out of his way to help me get into a truck that was right for me. AutoGroup is a great place to buy a vehicle. Everyone there is extremely helpful and patient. I highly recommend seeing Bill at AutoGroup if you are in need of a vehicle." Thanks Robert, and a BIG thanks from the Auto Group! 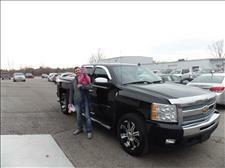 We appreciate your continued business, and hope you and Alivia enjoy your new Chevrolet Silverado! "Auto Group Leasing was great to work with! 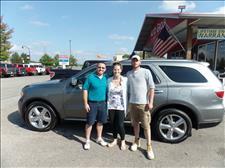 They were efficient with assistance and happy to make the purchase of a new vehicle pleasant. Bill was very helpful and easy to work with. I would recommend them to anyone looking for a new vehicle. :) "
Thanks Brandi, and a BIG thanks from the Auto Group! 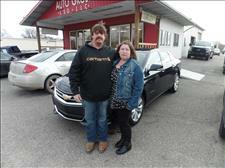 We appreciate the opportunity to earn your business, and hope you enjoy your new Chevrolet Cruze! 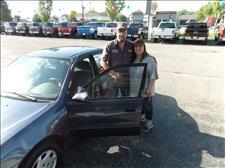 "This is our second car we have purchased from Bill. Very happy and we know we will come back again! Thank you!!" Thanks Cody and Lisa, and a BIG thanks from the Auto Group! 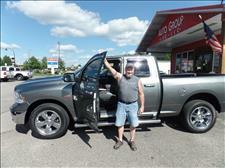 We appreciate your continued business, and hope you enjoy your new Ram 1500! 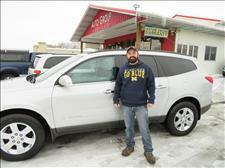 "I was very pleased with my auto purchase. everything was quick and stress free. mike is a great salesman. will buy here again." Thanks Chris, and a BIG thanks from the Auto Group! 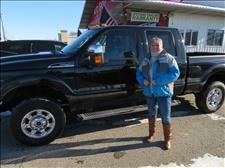 We appreciate the opportunity to earn your business, and hope you enjoy your new Ford F-250! 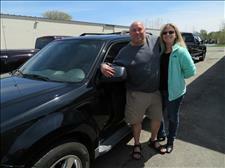 "Bruce was a great salesman and great to work with great company"
Thanks Pam, and a BIG thanks from the Auto Group! 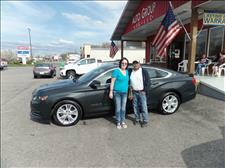 We appreciate the opportunity to earn your business, and hope you and Clinton enjoy your new Chevrolet Impala! "I had a pleasure working with this group. They were helpful and cheerful throughout the entire process. We thank you for our next family vehicle." Thanks Brianne, and a BIG thanks from the Auto Group! 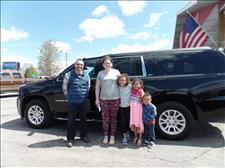 We appreciate the opportunity to earn your business, and hope you and your family enjoy your new Chevrolet Suburban! "Bill was awesome! 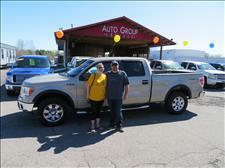 Auto Group went out of their way to put us in a truck and couldn't be happier!" Thanks Ronald and Tamara, and a BIG thanks from the Auto Group! 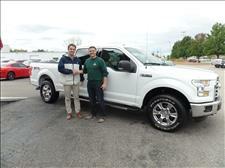 We appreciate the opportunity to earn your business, and hope you enjoy your new Ford F-150! 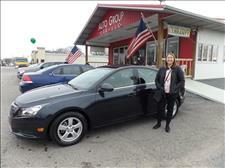 "The folks at the auto group have treat us well for our last two car purchases. As long as we live nearby they will be one of the first to earn our future business." Thanks James, and a BIG thanks from the Auto Group! 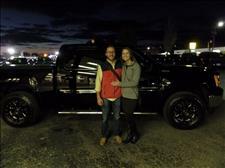 We appreciate your continued business, and hope you and Jessica enjoy your new GMC Sierra! 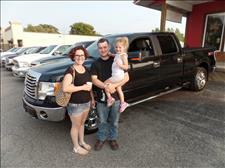 "We made a trip from Rockford because we had seen the great selection of trucks online...it was well worth the trip! All the staff were great, friendly and very helpful! We'll recommend you guys to anyone we know looking for a vehicle. Thanks for all the help!" Thanks Roger and Diane, and a BIG thanks from the Auto Group! 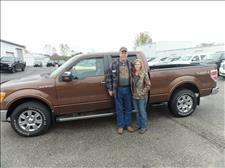 We appreciate the opportunity to earn your business, and hope you both enjoy your new Ford F-150! "Everyone was friendly and very helpful. Cut right to the chase"
Thanks Aaron, and a BIG thanks from the Auto Group! 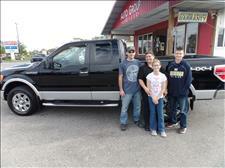 We appreciate the opportunity to earn your business, and hope you and the whole family enjoy your new Ford F-150! all of my goals and expectations were met or exceeded. I will be returning here for my next truck! Thanks Jon, and a BIG thanks from the Auto Group! We appreciate the opportunity to earn your business, and hope you enjoy your new GMC Sierra 2500! "Everything was so easy, it was a joy. We didn't feel any pressure but felt like we were well taken care of and offered the very best in price and quality." Thanks Jackie and Tyler, and a BIG thanks from the Auto Group! 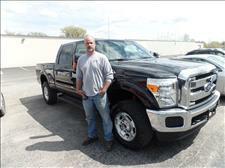 We appreciate the opportunity to earn your business and hope you enjoy your new Ford F-350! "MARK RUDY IS ONE OF THE BEST SALES PERSON HE DOES HIS BEST TO HELP YOU GET A CAR. MARK DOES NOT STOP UNTIL YOU GET WHAT YOU WANT . ALL THE STAFF IS FRIENDLY . SO IF YOU ARE WANTING TO GET A CAR AUTO GROUP IS THE PLACE.THIS IS THE SECOND VEHICLE FROM THEM AND MARK IS THE ONE I DEAL WITH"
Thanks Kristy, and a BIG thanks from the Auto Group! 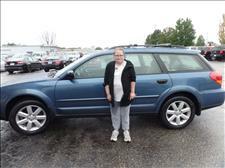 We appreciate your continued business, and hope you enjoy your new Subaru Outback! "I was well taken care of! In and out in a timely manner, drove away a much happier car owner. Jay Button is especially helpful, friendly, and genuine. Glad I got to do business with them!" Thanks Angela, and a BIG thanks from the Auto Group! 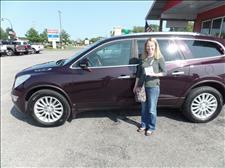 We appreciate the opportunity to earn your business, and hope you enjoy your new Buick Enclave! "Super fun and easy to work with. i got my dream car because of Bill, your the man(haha)"
Thanks Donny, and a BIG thanks from the Auto Group! 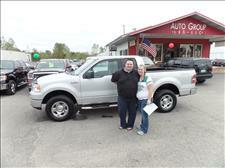 We appreciate the opportunity to earn your business, and hope you and Ranae enjoy your new Ford F150! "Great Service! Mike H. is awesome to work with and made the process very easy." Thanks Bart, and a BIG thanks from the Auto Group! 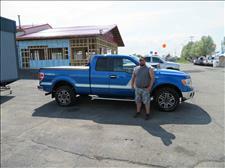 We appreciate the opportunity to earn your business, and hope you enjoy your new Ford F150! 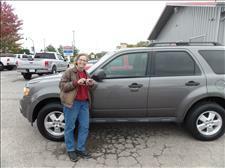 "we appreciate the fact that you helped us get the vehicle that we really wanted . Thank you for your excellence"
Thanks Amy, and a BIG thanks from the Auto Group! 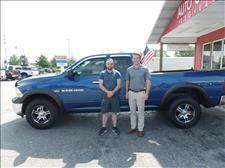 We appreciate your continued business, and hope you and Patrick enjoy your new Dodge Ram 1500! "Had great customer service. Bill was amazing. 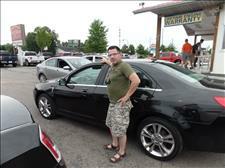 He made the experience of buying a vehicle very relaxed and comfortable. I will definitely recommend to all my friends and family." Thanks Shawn, and a BIG thanks from the Auto Group! 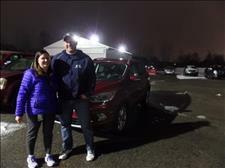 We appreciate the opportunity to earn your business, and hope you and Jenna enjoy your new Ford Edge! 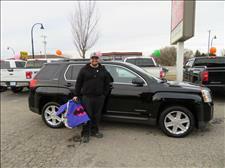 "This was my first big car purchase on my own and Jay was awesome and very patient with me! The Auto Group was really transparent and honest throughout the process." Thanks Kenzie, and a BIG thanks from the Auto Group! 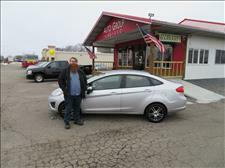 We appreciate the opportunity to earn your business, and hope you enjoy your new Ford Focus! "Staff was easy to talk to and easy to work out a great deal with. The warranty's give me a reassurance that is priceless." Thanks Ralph, and a BIG thanks from the Auto Group! We appreciate the opportunity to earn your business, and hope you enjoy your new Ford F-150! "Auto Group employees were helpful and answered all my questions. Made me feel very comfortable when deciding to purchase a vehicle." Thanks Clark, and a BIG thanks from the Auto Group! We appreciate the opportunity to earn your business, and hope you enjoy your new Dodge Durango! "Great customer service!! Fast the friendly car buying experience." Thanks Tyler, and a BIG thanks from the Auto Group! 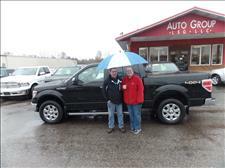 We appreciate the opportunity to earn your business, and hope you enjoy your new Ford F-150! "Very nice and helpful staff. Everyone was easy to work with and made our buying experience fun. I would recommend Auto Group to anyone." Thanks Vern and Samantha, and a BIG thanks from the Auto Group! 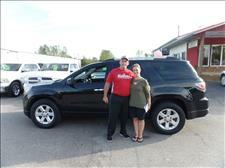 We appreciate the opportunity to earn your business, and hope you enjoy your new GMC Acadia! 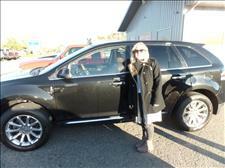 "We had a very friendly experience with the purchase of our new car. 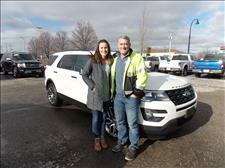 Mark and Tiffany were exceptional and very knowledgeable about the entire process! We will definitely refer people to them." Thanks Kelli and Michael, and a BIG thanks from the Auto Group! 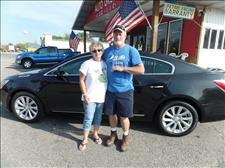 We appreciate the opportunity to earn your business, and hope you both enjoy your new Buick LaCrosse! "Brandon Ley has now sold us our 4th vehicle here at Auto Group! We love the atmosphere and they are always willing to help us out! Tiffani is so much fun to work with! We will be back!" Thanks Whitney, and a BIG thanks from the Auto Group! We appreciate your continued business, and hope you and Jerimiah enjoy your new Dodge Durango! "The service was quick and painless. The agent was professional and very informed in regards to the available inventory." Thanks Trent, and a BIG thanks from the Auto Group! 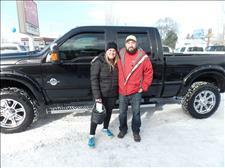 We appreciate the opportunity to earn your business, and hope you Bianca, and a Eliza enjoy your new Ford F150! "Mark was awesome, he was helpful and answered all my questions with ease. He was able to get me into my new car in a matter of hours. This car experience was the best I have ever had. Good Job Mark!" Thanks Julie, and a BIG thanks from the Auto Group! 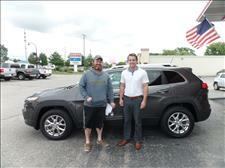 We appreciate the opportunity to earn your business, and hope you enjoy your new Jeep Compass! "I found out about your dealership through car fax. My interactions with Jay Button and the rest of the staff were professional and first rate. I did not feel pressured to by and all negotiations were fair and balanced. A repair to the vehicle I purchased was done exceptionally well and in an expeditious manner. I hope I enjoy my purchased vehicle and I will make sure to refer others to your business establishment." Thanks Jay, and a BIG thanks from the Auto Group! We appreciate the opportunity to earn your business, and hope you enjoy your new Jeep Grand Cherokee! 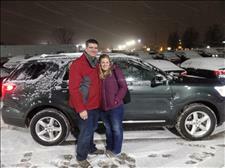 "My husband and I had a great experience here with the Auto Group and Mark Rudy. The people were friendly, and they were fair in our negotiations. We are repeat customers as well, so we were glad to have another great experience here." Thanks Laurie, and a BIG thanks from the Auto Group! We appreciate the opportunity to earn your business, and hope everyone enjoys your new Dodge Durango! 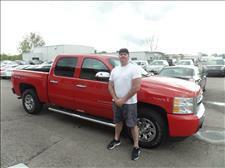 "Bruce Laufer was awesome sales representative. Everyone was very courteous. Happy customer! Will come here again!" Thanks Grace, and a BIG thanks from the Auto Group! 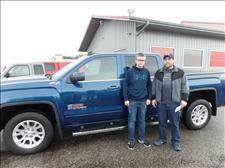 We appreciate the opportunity to earn your business, and hope you enjoy your new GMC Sierra 2500! 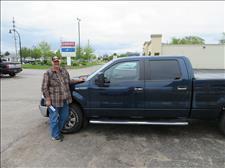 "Bruce did an great job helping us find our new truck. We had a great experience in a no pressure environment. Very pleased with our new truck!" Thanks Matt, and a BIG thanks from the Auto Group! 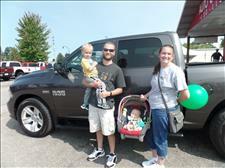 We appreciate the opportunity to earn your business, and hope you and the whole family enjoy your new Ram 1500! "jay and Tiffany were awesome with helping me find a car they both took great care of me and everyone else in the office was great for dealing with me for a whole day. thank you"
Thanks Samantha, and a BIG thanks from the Auto Group! 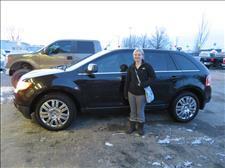 We appreciate the opportunity to earn your business, and hope you enjoy your new Ford Edge! "Bruce was amazing in showing us all the vehicles that we wanted to drive. We were welcomed in the business as if we were a part of the business. Excellent treatment from the start to finish of our purchasing the car. Tiffani was wonderful and very happy and amazing to us also. Thank you so much for being so wonderful to us." Thanks Shelia, and a BIG thanks from the Auto Group! We appreciate the opportunity to earn your business, and hope you and Steven enjoy your new Cadillac SRX! "Everyone was really nice and easy going! They all explained the car and the processes of buying it really good. Mike was really helpful and so was Tiffani." Thanks Kaitlin, and a BIG thanks from the Auto Group! 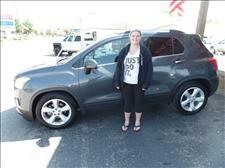 We appreciate the opportunity to earn your business, and hope you enjoy your new Chevrolet Trax! 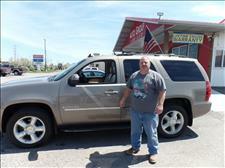 "Jay was friendly and helpful and put us in a SUV in no time. I have had no problems and would recommend in the future." Thanks Jerome and Matthew, and a BIG thanks from the Auto Group! 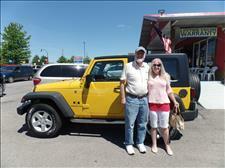 We appreciate the opportunity to earn your business, and hope you both enjoy your new Jeep Wrangler! "I received great service from Bruce and was very impressed by the service." Thanks Carrie, and a BIG thanks from the Auto Group! 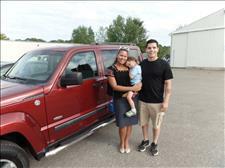 We appreciate the opportunity to earn your business, and hope you enjoy your new Dodge Nitro! "This has been a great experience and was a pleasure working with Mike and Tiffany. I would recommend this dealership to others." Thanks Heather, and a BIG thanks from the Auto Group! 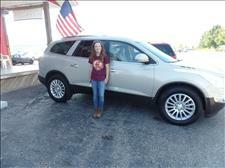 We appreciate the opportunity to earn your business, and hope you enjoy your new Buick Enclave! "Excellent! Mike was a great salesman. Tiffany was also wonderful. Great experience. I would most certainly come back." Thanks Kristi, and a BIG thanks from the Auto Group! 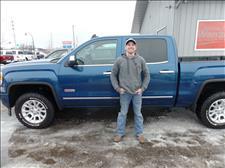 We appreciate the opportunity to earn your business, and hope you enjoy your new GMC Sierra 1500! "My experience was absolutely amazing. From the telephone calls to the insurance and banking. Very pleased with the service and professionalism." Thanks Sandy, and a BIG thanks from the Auto Group! 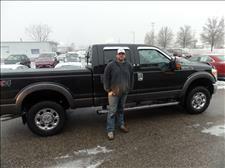 We appreciate the opportunity to earn your business, and hope you enjoy your new Ford F-250! 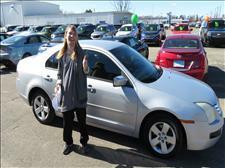 "This was my first time buying a car all by myself and it was absolutely wonderful! My sales person was great and he worked very hard to make sure that I got EVERYTHING that I wanted. The finance manager is a truly wonderful woman as well. I would recommend anyone and everyone to come here if you're looking to buy a vehicle with amazing quality that is truly affordable. These people work for YOU!!" Thanks Leslie, and a BIG thanks from the Auto Group! 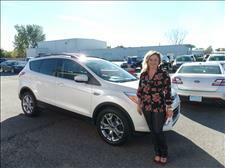 We appreciate the opportunity to earn your business, and hope you enjoy your new Ford Escape! Bill was a wonderful person to work with. He made sure that we got what we wanted. The owner also helped us out making sure that we got the best deal. If you are looking for a new vehicle then this is the place to go." Thanks Joanna, and a BIG thanks from the Auto Group! 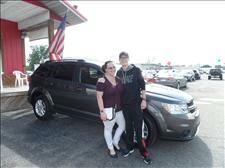 We appreciate the opportunity to earn your business, and hope you and Bradley enjoy your new Dodge Journey! "Awesome sales people. This is the 5th car that we have bought from this company would recommend this place to anyone." 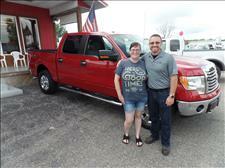 Thanks Elizabeth, we appreciate your continued business, and hope you and Robert enjoy your new truck! "Bruce was very helpful and easy to work with a real pleasure to deal with." Thanks Harry, and a BIG thanks from the Auto Group! 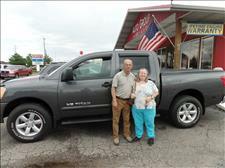 We appreciate your continued business, and hope you and Debra enjoy your new Nissan Titan! "had a great experience with mark at the auto group,"
Thanks Wayne, and a BIG thanks from the Auto Group! 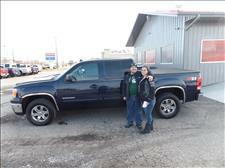 We appreciate the opportunity to earn your business, and hope you enjoy your new GMC Sierra 2500! "very pleased with their customer service and satisfaction. process went smooth and fast, looked at vehicle and bought the next day,"
Thanks Devan, and a BIG thanks from the Auto Group! 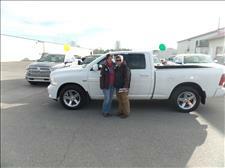 We appreciate the opportunity to earn your business, and hope you enjoy your new Ram 1500! "The service was quick, friendly and informative very helpful. I am very pleased and would recommend this dealership to any friend." Thanks Harold, and a BIG thanks from the Auto Group! 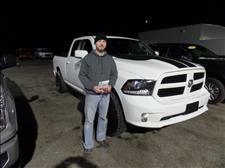 We appreciate the opportunity to earn your business, and hope you enjoy your new Ram 1500! "What a great car buying experience. I will be sure to come back. Thanks You Jay Button for all your help it is truly appreciated." Thanks Clifford, and a BIG thanks from the Auto Group! 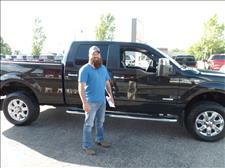 We appreciate the opportunity to earn your business, and hope you enjoy your new Ford F150! "It was a pleasure working with Auto Group. We would gladly recommend them to friends and family and purchase from them again." Thanks Mike, and a BIG thanks from the Auto Group! 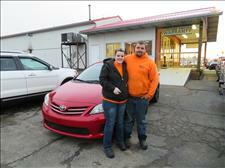 We appreciate the opportunity to earn your business, and hope you and Stacey enjoy your new Toyota Corolla! 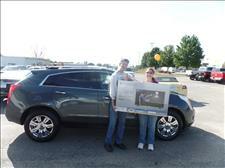 "BRANDON AND TIFFANY ARE AMAZING THEY WENT ABOVE AND BEYOND TO MAKE THIS SALE HAPPEN. AUTO GROUP HAS ALWAYS BEEN A CLASS A BUSINESS AND NOT ONLY HAVE GREAT SALESMAN BUT BETTER FRIENDSHIP. THANK YOU FOR EVERYTHING"
Thanks Danny, and a BIG thanks from the Auto Group! 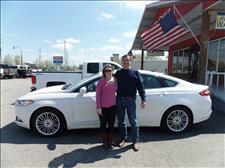 We appreciate your eighth purchase from us and hope you enjoy your new Ford Fusion! "very helpful i was in and out with a new car in no time even took the time to get me the best insurance rate thank you mike and tiffani"
Thanks Brian, and a BIG thanks from the Auto Group! We appreciate the opportunity to earn your business, and hope you enjoy your new Jeep Cherokee! 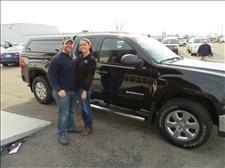 "Fantastic experience my wife and I could not be happier with salesman Bruce and Tiffany. Thank you! highly recommend"
Thanks Dan, and a BIG thanks from the Auto Group! 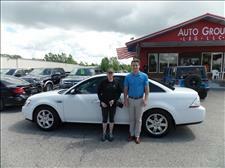 We appreciate the opportunity to earn your business, and hope you and your wife enjoy your new Ford Taurus! 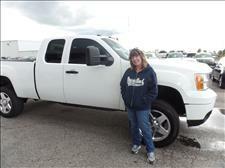 "Mike Helmer was a great salesmen, very professional. I will for sure come back and buy again." Thanks Terry, and a BIG thanks from the Auto Group! 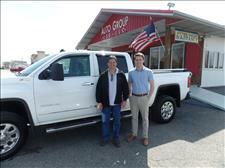 We appreciate the opportunity to earn your business, and hope you enjoy your new GMC Sierra 2500! "process went very smooth and Mike was very helpful. We are super pleased and excited." Thanks Joseph, and a BIG thanks from the Auto Group! 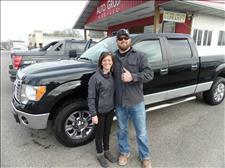 We appreciate the opportunity to earn your business, and hope you and Ashley enjoy your new truck! 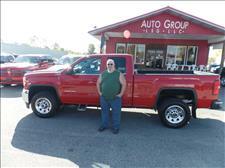 "Very friendly and did a lot of work to help me find the right vehicle! will be back in future." Thanks Tracey, and a BIG thanks from the Auto Group! 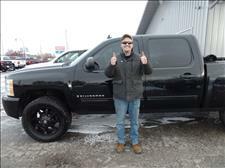 We appreciate your continued business, and hope you enjoy your new truck! "Bruce was very king and personable throughout my day here at Autogroup, LLC." Thanks Bobby, and a BIG thanks from the Auto Group! We appreciate your continued business, and hope you enjoy your new Lincoln MKZ! "Everyone was very kind and helpful. I would recommend them in the future!" Thanks Katie, and a BIG thanks from the Auto Group! 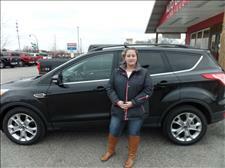 We appreciate the opportunity to earn your business, and hope you enjoy your new Ford Escape! "The process was quick and efficient. The staff were willing to contact several banks in order to help find the best financing options." Thanks Nelson, and a BIG thanks from the Auto Group! 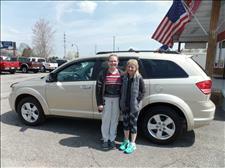 We appreciate the opportunity to earn your business, and hope you and Amanda enjoy your new Dodge Journey! "very helpful and courteous. i would do service here again. good experience"
Thanks Amanda, and a BIG thanks from the Auto Group! We appreciate the opportunity to earn your business, and hope you enjoy your new Ford Taurus! "Exceptional service! Jay was great to work with." Thanks Derek, and a BIG thanks from the Auto Group! 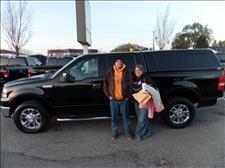 We appreciate the opportunity to earn your business, and hope you enjoy your new Ford F150! "Everyone treated us well and any problems were fixed without any issues!" Thanks Nicole, and a BIG thanks from the Auto Group. 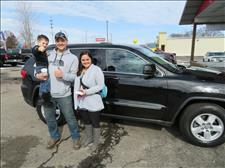 We appreciate the opportunity to earn your business, and hope you, Chris, Easton, and Oakley enjoy your new Yukon! "Good experience and wonderful service! 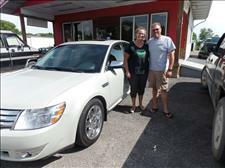 Mike and Tiffany were very helpful!!" Thanks Frank, and a BIG thanks from the Auto Group! 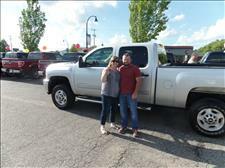 We appreciate the opportunity to earn your business, and hope you enjoy your new Silverado 2500! "Bill was very helpful and knowledgeable, Tiffani did a great job in the finance office. Overall a very pleasurable experience"
Thanks Kenny, and a BIG thanks from the Auto Group! 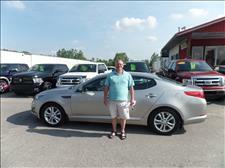 We appreciate the opportunity to earn your business, and hope you enjoy your new Kia Optima! "I was unsure about purchasing a vehicle that was out of my price range. Mike and Brandon did a really good job with working with my budget and providing information for me. I appreciate everyone's help. I will more than likely send family/friends here if they are having trouble looking for a vehicle. Thank you." Thanks Elissa, and a BIG thanks from the Auto Group! 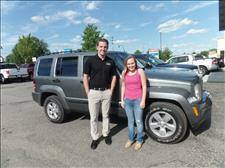 We appreciate the opportunity to earn your business, and hope you enjoy your new Jeep Liberty! 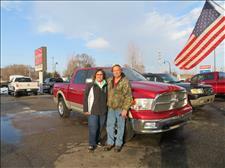 "Bruce and Tiffany made purchasing a vehicle easy. Fun to work with and we look forward to working with them again. Thank you for your help." Thanks Tim and Joan, we appreciate the opportunity to earn your business, and hope you both enjoy your new Jeep Wrangler! "Auto Group worked with me to find a deal and a car that worked for me and my financial situation." Thanks Megan, and a BIG thanks from the Auto Group! 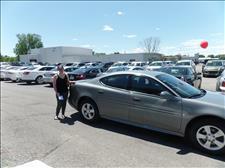 We appreciate the opportunity to earn your business, and hope you enjoy your new Pontiac Grand Prix! 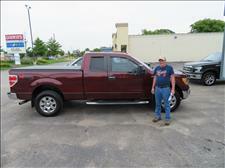 "experience was great was not sure that i was able to get approved for this truck. was already to one dealership before this one and they wouldnt even look at me to get financed the auto group helped me with this and were willing to work with me and i was APPROVED!!" Thanks Robert, and a BIG thanks from the Auto Group! 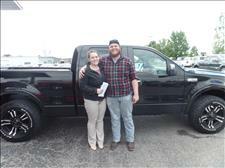 We appreciate the opportunity to earn your business, and hope you and Taylor enjoy your new Ford F150! "Easy to work with individuals, good pricing, would definitely recommend." Thanks Martin, and a BIG thanks from the Auto Group! 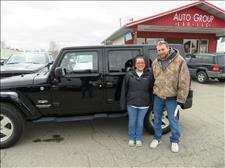 We appreciate the opportunity to earn your business, and hope you enjoy your new Jeep Wrangler! "I had not planned on purchasing a vehicle on the day that I did, however Jay and the Auto Group made it so easy and affordable I couldn't pass up the opportunity. Thank you!!!!" Thanks Timmy, and a BIG thanks from the Auto Group! 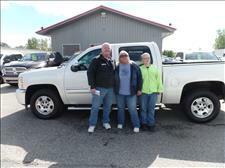 We appreciate the opportunity to earn your business, and hope you enjoy your new Chevrolet Silverado! "Very helpful and extremely patient! We appreciate all that Jay did to help us the last few months." Thanks Sonny, and a BIG thanks from the Auto Group! 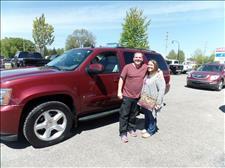 We appreciate the opportunity to earn your business, and hope you and Heidi enjoy your new Chevrolet Tahoe! "Bill is an excellent agent. Very helpful, friendly and made me feel comfortable during the buying process. You all worked with me to make this deal. Love my car...thanks"
Thanks Daneen, and a BIG thanks from the Auto Group! 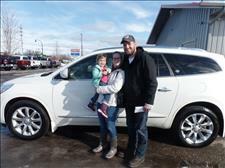 We appreciate the opportunity to earn your business, and hope you enjoy your new Buick Enclave! "The staff was GREAT to work with. Brandon was spectacular to work with. We will definitely recommend them to others. Thank you"
Thanks Eric, and a BIG thanks from the Auto Group! 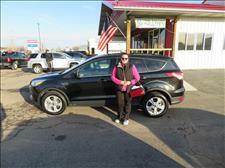 We appreciate the opportunity to earn your business, and hope you enjoy you new Ford Escape! 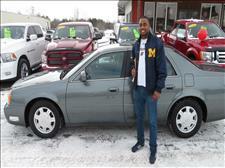 "This is the 3rd car I have purchased from Brandon at Auto Group. I highly recommend Brandon and the Auto Group for all your used car needs." Thanks Elise, and a BIG thank from the Auto Group! 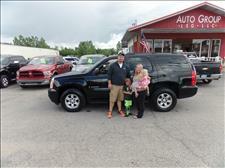 We appreciate your continued business, and hope the whole family enjoy your new GMC Yukon! "Great experience as usual, being a return customer and will be back for my next vehicle!! very friendly staff that is definitely looking to get you the vehicle your looking for, at the price that works for you." Thanks Mike, and a BIG thanks from the Auto Group! We appreciate your continued business, and hope you enjoy your new Ford Super Duty! "I was really happy with the way Auto Group was able to work with me to get me in a new vehicle. Everyone here was patient, courteous and polite. Will do business again with Auto Group!" Thanks Dale, and a BIG thanks from the Auto Group! 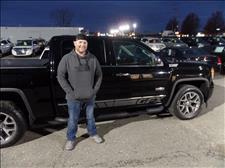 We appreciate the opportunity to earn your business, and hope you enjoy your new GMC Sierra! "jay was awesome he's a great sales man he goes the extra mile to help his customers out very straight forward thank you jay for help us out on our car thank you"
Thanks Dave and Pam, and a BIG thanks from the Auto Group! 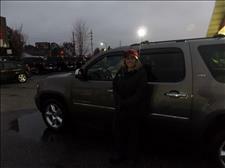 We appreciate the opportunity to earn your business, and hope you enjoy your new Chevrolet Tahoe! "apply late one night they called me first thing next morning and had me approved and out the door in 2 hours with less then perfect credit thanks bruce"
Thanks Will, and a BIG thanks from the Auto Group! 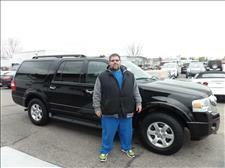 We appreciate the opportunity to earn your business, and hope you enjoy your new Ford Expedition! "excellent service, process was very smooth and quick recommend them highly." 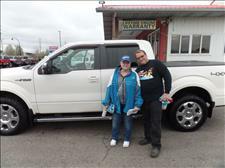 Thanks Jayne and Jerry, we appreciate the opportunity to earn your business, and hope you enjoy your new Ford F150! "The staff here was amazing and very helpful. The experience exceptional and very quick. i would recommend this place to anyone." Thanks Danny, and a BIG thanks from the Auto Group! We appreciate the opportunity to earn your business, and hope you and Angel enjoy your new Hummer H3! 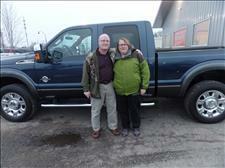 "Bruce was extremely helpful and eager to make us happy with our purchase. A credit to your company!" Thanks Bert, and a BIG thanks from the Auto Group! We appreciate the opportunity to earn your business, and hope you and Mary enjoy your new Dodge Durango! "Helpful staff, good sales people, good experience. Not typical pushy car salesmen. Worked well with us." Thanks Steven, and a BIG thanks from the Auto Group! 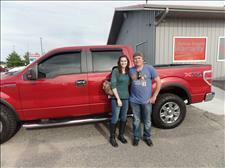 We appreciate the opportunity to earn your business, and hope you and Katy enjoy your new Ford F150! "Service was fantastic! Bill was very helpful and easy to talk to! Would recommend to anyone!" Thanks Caitlin, and a BIG thanks from the Auto Group! 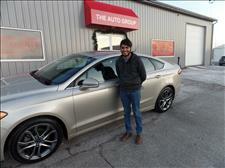 We appreciate the opportunity to earn your business, and hope you enjoy your new Ford Fusion! "Bruce was very nice and helpful and got us in a car we were looking for so the experience was good for us." Thanks Amanda, and a BIG thanks from the Auto Group! 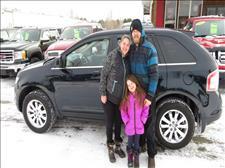 We appreciate the opportunity to earn your business, and hope you and Catherine enjoy your new Dodge Journey! "process went very smoothly and happy with the deal"
Thanks Pete, and a BIG thanks from the Auto Group! We appreciate the opportunity to earn your business, and hope you enjoy your new GMC Sierra 2500! 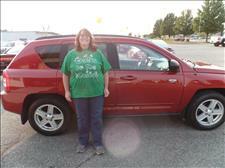 "We were able to get the car we wanted and were treated well. 3rd vehicle we have purchased from here."